It’s that time of year again! 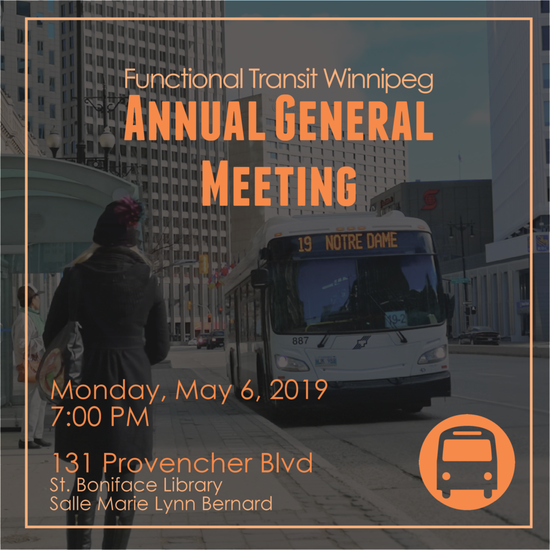 Our Annual General Meeting will be taking pace on Monday, May 6 at 7 PM. The meeting will be at the St. Boniface Library at 131 Provencher Blvd. Everyone is welcome and members are entitled to vote on all motions. In 2017 we worked with over 100 partner organizations in Winnipeg to demand no cuts for transit service in Winnipeg, now we’re fighting to restore provincial funding which was cut in 2017. Effective public transit is in the province’s interest and we are urging Manitobans to get in touch with their MLAs and let them know. There are many ways you can help make the difference for transit in Manitoba. The most important way to get involved is to email your MLA. Winnipeg Transit is proposing improved bus routes in southwest Winnipeg to coincide with the opening of the Southwest Transitway (Stage 2) in spring 2020. Winnipeg Transit is proposing improved bus routes in southwest Winnipeg to coincide with the opening of the Southwest Transitway (Stage 2) in spring 2020, subject to Council approval. Please visit the Routes tab to learn more, and visit the Engage tab to take the online survey. The Southwest Transitway is a dedicated high-speed roadway for buses, physically separated from the regular street system linking Downtown to the southwest part of the city. Buses operate at speeds up to 80 km/h, free of any other traffic, providing very fast, reliable service. Stage 1 of the Southwest Transitway, completed in 2012, currently runs from Queen Elizabeth Way & Stradbrook Avenue to Pembina Highway and Jubilee Avenue. Once Stage 2 is completed, anticipated in spring 2020, the Southwest Transitway will operate from Downtown to the neighbourhoods of southwest Winnipeg, including the University of Manitoba. Winnipeg is growing and our transit system needs to grow too. In the next 25 years, we expect that nearly one million people will call our city home. Now is the time to think ahead about our future transit system. How will we connect people and communities around the city in a sustainable and efficient way? The Winnipeg Transit Master Plan will lay out a vision for our future transit system and describe the steps we need to take to get there. It will cover all aspects of the public transit system – Transit, Rapid Transit, and Winnipeg Transit Plus (formerly Handi-Transit) service and infrastructure. The Winnipeg Transit Master Plan will be a guide for the next 25 years, and we are looking for your input as we work on this plan. Your thoughts and ideas will help to shape our transit system for the future.